When you think little cigars or filtered cigars, you probably think of low-quality cigars that are sold for about $15 a carton. 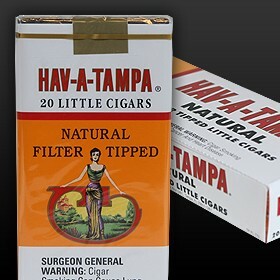 In a lot of instances, that is exactly what you get, but Hav-A-Tampa Little Cigars are in a whole different league. Manufactured by Altadis of Tampa, Florida (who also make Dutch Masters, Montecristo, Phillies and many other brands), these cigars are at the top-end of machine made filtered cigars. The package itself is rather colorful with summery oranges and reds, and features a lady on the front. The pack is presentable, and I much prefer it over the scores of brands with giant Native American heads or horses on the front. I am not a rustic guy, and I find those packs look awful when I pull them out at the office. This may or not may matter to you, but if you work in an urban environment you might feel silly carrying around cowboy smokes. The tobacco is really what makes Hav-A-Tampa Little Cigars something special. It is a carefully crafted blend of Dominican and Honduran tobacco, that makes for a very mild and smooth character that is sure to pair well with everything from scotch to beer. To the nose the aroma of the cigar and the smoke is one of my favorites, and I enjoy it more than many premium full-sized cigars. It won't fill the room up like a big cigar (which is a big plus in my book) and does not linger overly long, but it sits well and I have to admit that I enjoy the smell of the smoke as much as smoking it. Smoking the Hav-A-Tampa Little Cigars is also a treat. It has subtle flavors, and the Natural version has great character. The Sweets are not overly sweet, and have a nice taste that does not overpower the tobacco or have any of the chemical tastes that I often encounter in cheap sweet filtered cigars. As far as price, Hav-A-Tampa Little Cigars are more expensive than value brands, but I think the money is well worth it. For under $3 a pack you can smoke a high-quality filtered cigar from a very reputable company, and with the prices of cigarettes and other tobacco products so high, this is truly a steal for any smoker.